Make a batch of this hearty Baked Steel Cut Oatmeal with Apples and Cinnamon and enjoy breakfast all week long. Oatmeal was not my favorite breakfast when I was younger. I would eat it but never really craved it until years later when I was introduced to Irish oatmeal (otherwise knows as steel cut oatmeal) on our honeymoon in Ireland. 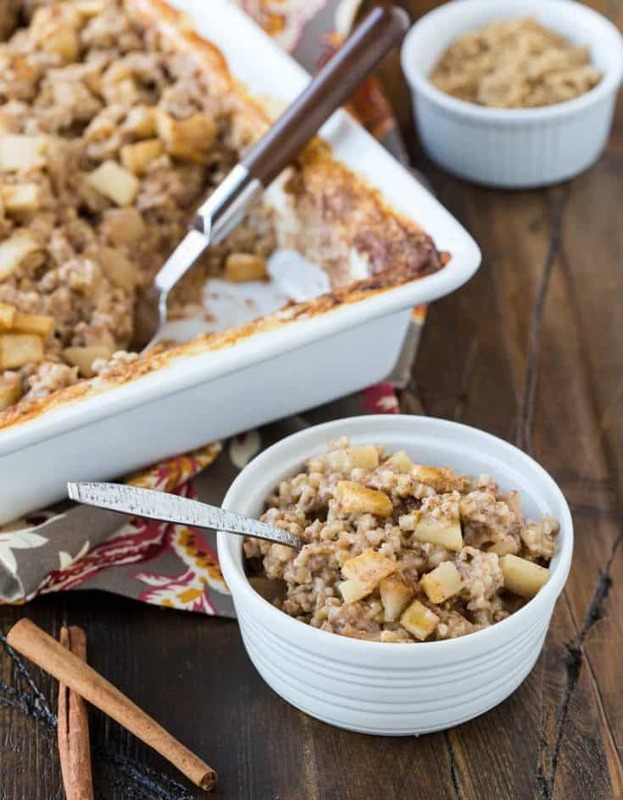 Now it’s one of my favorite breakfasts, and this recipe for Baked Steel Cut Oatmeal with Apples and Cinnamon brings me right back to the Emerald Isle. I toast the oats on the stove in this recipe before I bake them, and I highly recommend this step. Why? This little bit of effort truly enhances the flavors and add more depth to the already hearty steel cut oats. Feeding a crowd? 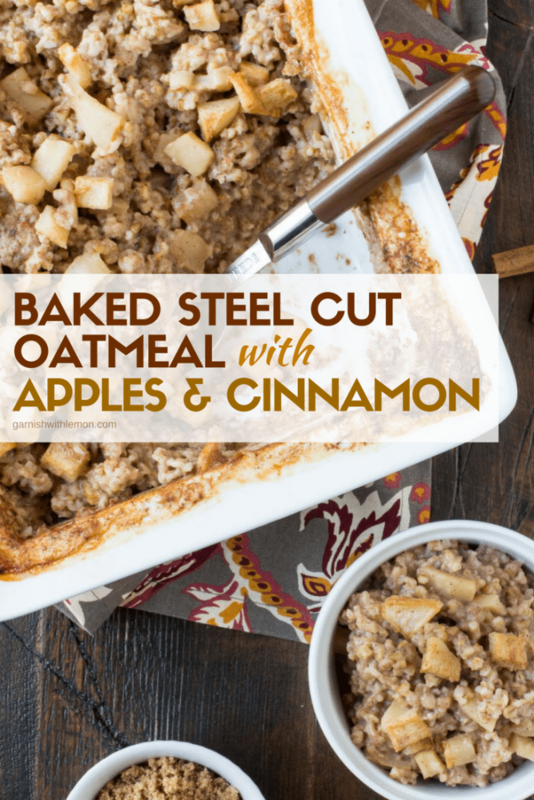 This recipe makes a huge batch of baked steel cut oatmeal and is perfect for weekday breakfasts or brunch for a bunch. It takes about an hour to bake, so you can even make it ahead of time and reheat individual portions when needed. Tip: Reheating the oatmeal? Add a little milk to regain the creamy texture. Serve with brown sugar and maple syrup, of course! . Hosting brunch? Serve this Baked Steel Cut Oatmeal with some smoothie shooters and a few muffins, and you have yourself a perfect menu for weekend guests. Preheat oven to 375 degrees and grease a 9 x 13 pan. Melt butter in skillet and add oats. Stir until lightly toasted. Put oats in a large mixing bowl and pour boiling water over them. Add apples, cinnamon, brown sugar and salt and stir until combined. Add milk and stir. Pour into prepared dish and bake for 50-60 minutes or until browned and set. This reheats well. Just add a little milk before you reheat to prevent the oatmeal from drying out. I have been looking for a baked oatmeal recipe that doesn’t use eggs. This sounds delicious! Is all Irish Oatmeal steel cut? I looked at the many oatmeal choices at my favorite grocery store today and was totally confused….HELP! What a great recipe, made it for visiting guest and she loved it. Since it was only two of us I half the recipe and used some of my frozen apples from a former apple orchard visit. Hi Nancy, I’m glad you both liked it! Frozen apples from the orchard would be fabulous in it! Yum! Thanks Marla! Can’t wait to read it! I might make this tonight, looks awesome and breakfast for the rest of the week would be done ! It is a great make ahead breakfast! Perfect for weekday mornings. Enjoy! I just made it using light cocnut milk and earth balance to make it vegan. I skipped the skillet and toasted the oats with the ‘butter’ in the pan while the oven was preheating. I poured everything into a bowl and then back into the pan which I had greased, it was already warm so that was easier. Yummy! I like that it can be made much quicker than in a crock pot. Good for a weekend morning. Great substitutions! I use Earth Balance all of the time and love it! I’ve been looking for steel cut oats recipe that isn’t an overnight crock pot so this looks perfect! Do you recommend reheating stove-top, microwave or in a warm oven? I reheat it in the microwave for time purposes, but I’m sure it would be great whichever way you choose. I recommend adding a little milk before reheating to give it the creamy texture. HI. Love this. I have made this several times now. I only had 1 apple and 1 banana the first time i tried so that is what I used. I forgot to use the milk a couple of times ago. I just added it about 5 min before timer went off. Then put it back in the oven for 5 min. This has become a fav method of mine. Depending on what fruit and added ingredients I have put in I can adjust the moisture content the way I feel by adding in at the end. I end up using a little less then what the recipe calls for i general but i tend to like it a little thicker and chewier. But the almond milk at the end give a boost of creamey texture. Found some peanut butter powder that has chocolate powder mixed in. I love using all banana in the oatmeal and then sprinkling the peanut butter powder on top. I have been making 2 batches at once and portioning them into muffin pans and freezing them. Then i can take on the run to work and microwave with a splash of water or almond milk heck i used my coffee one time. you can spray the muffin pans then pop em out and put them in a freezer bag. This was so hearty & delicious! I loved the fact that it was steel cut oats too. I am making blueberry/strawberry right now-I hope it’s as delicious. Thanks for a great recipe! Ooh, that sounds delicious! Let me know how it is! Did anyone else find this terribly salty? The salt is overpowering. I used 1 1/2 tsp as the recipe said. After I tasted it, I checked the regular directions on my bag of Steele Cut Oats and it only calls for 1/4 tsp per 1 cup of oats. So, this recipe has 3 times the amount of salt? I’m very disapointed that I wasted all those ingedients. I’m not sure there is any way to salvage it. I’m sorry this didn’t work out for you, Lorraine. Everyone has different tastes. I hope you found a way to suit yours. I found the same thing. I’m a salt lover and I couldn’t eat it. Made it again and used a 1/2 tsp of salt and it was perfect! This is an awesome recipe, I’ll be making it again and again! Thanks for the comment, Kate! Enjoy! Don’t forget that if you are using salted butter, it adds more salt… i added a sprinkle of salt along with my salted butter because it enhances the taste of the sugar but not nearly as much as the recipe called for… waiting for it to come out of the oven as i type this! I love having this for breakfast! I’ve been adding raisins after warming it up and it tastes amazing! Thanks! Raisins are a yummy addition! We loved this, thank you! I increased the cinnamon, halved the salt, and used coconut milk. Just like you I was never a big fan as a kid, but now this is probably my favorite breakfast! Thank you for this lovely recipe!! It is comforting, satisfying, and a convenient way to have breakfast ready ahead of time, and especially since we are approaching fall and winter. Take care! I’ve never made oatmeal from scratch before. My 2 year old LOVES it for breakfast! I’m definitely going to have to try your recipe! Thanks, Betsy! It’s a keeper and smells soooo good while it’s baking! This sounds and looks delicious. I love oatmeal but have never tried steel cut oats. Now I have no excuse not to try them this recipe is great. Pinned. I want to gobble this up right now! Love the apples in the oatmeal. I followed the instructions exactly and the concoction was a watery mess. I’m disappointed. I am glad it worked for others; I’m not sure if it was the steel cut oats I was using or what. I’m sorry it didn’t work out for you! Thanks for the feedback. What a warm and comforting way to start your day! I love that you baked the oatmeal but that it is not a cake form. I love having another easy way to make oatmeal and these flavors. Adore apples and cinnamon together. I don’t eat oatmeal very often because I don’t love the texture. i should give steel-cut oats another try. This would a perfect breakfast for the freezing winter mornings we have been having lately! This was quite delicious. I also added a teaspoon of vanilla. This looks amazing!! I love oatmeal and am totally intrigued! I’m going to try to make it tomorrow. I was wondering if you know the nutritional information for a portion of this deliciousness? Any idea how many calories per serving? I’m sorry we don’t provide nutritional information on our recipes because it can vary so much depending on the products that you use. Try using something like this: http://www.myfitnesspal.com/recipe/calculator. Hope you like the oatmeal! I just made this, looked a little runny after an hour, so I baked an additional 10 minutes.. Perfect! I didn’t add the brown sugar and I used almond milk, I’ll freeze in muffin tins and warm in the morning with a little honey and almond milk. I’m hooked? I love the idea of freezing in the muffin tins! Thanks for your note! This will serve 8 people! I will update the recipe. Thanks for your note! nice recipe and change to my typical breakfast routine, like that its a large batch too for simpler prep and serving, thank you for this recipe! I know this is a very old post, but do you have a preferred type of apples for this? I usually use Granny Smith apples, but any kind will do. It’s an oldie, but goodie! I have never tried this exact recipe with regular rolled oats. 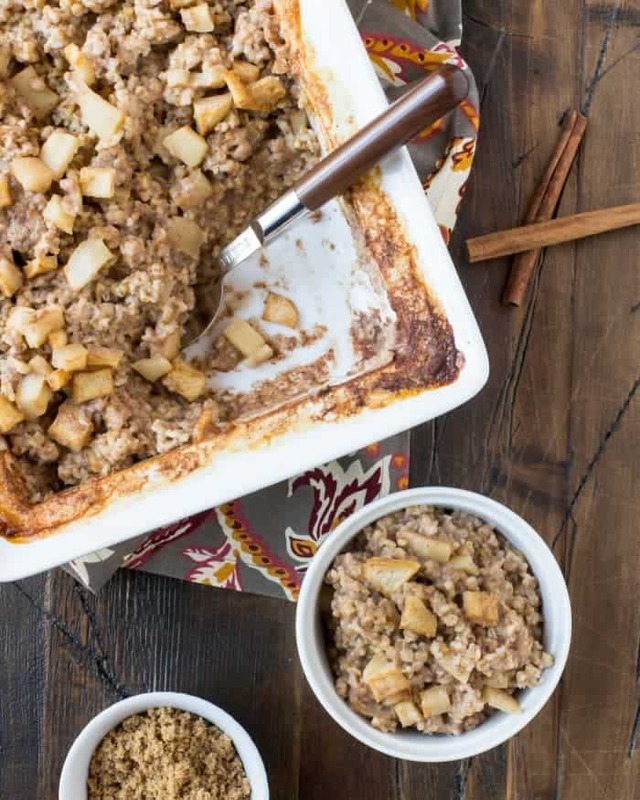 It might be easier to use this recipe https://www.garnishwithlemon.com/blueberry-baked-oatmeal/ and substitute the blueberries for apples and cinnamon. Good luck! Making this recipe and halving the recipe. Any idea on hoe long to bake a half recipe??? Can’t wait to try it in the morning. Hi Penny, I would start looking at the oatmeal at about 35 minutes and then bake it until it is set in the center. Happy eating! Cooking right now! Needs an extra 10 mins or so to fully set, but it smells wonderful! I didn’t have just plain cinnamon, so I used apple pie spice. I’ll comment again once I’ve tried it. Made this today and it was solo good. I didn’t have just cinnamon but I had apple pie spice. Topped with a brown sugar, butter walnut topping. Thanks for the recipe! I can’t wait to try this recipe. Can you make it the night before, put it in the refrigerator and bake the next day? Hi Heather, This recipe is best baked right after you mix it together.But it can easily be reheated this next day and still taste delicious! If you put it together overnight without baking, the oats will absorb all of the liquid. If you try it, let me know how it turns out! I loved this recipe. I added toasted almonds. I did mix all dry ingredients the night before and then mixed in the wet and baked the next day. My sons loved it and they hate regular oatmeal. This is my second attempt to comment on this awesome recipe. I put bananas and a little shredded coconut in mine and a little less liquids as we like it dyer. After it cools the next day, I cut in serving sizes and freeze. Its breakfast, a snack or dessert. It disappears fast.